A plan by the Government for on-the-spot fines of around €50 for cycling offenses is the wrong way to tackle bad behavior, Cllr Ciarán Cuffe (Green) said yesterday. Cuffe said there should be a plan to target the “causes of these problems in the first place”, however the on-the-spot fines were promised in the National Cycle Policy which was first introduced as Green/FF policy. 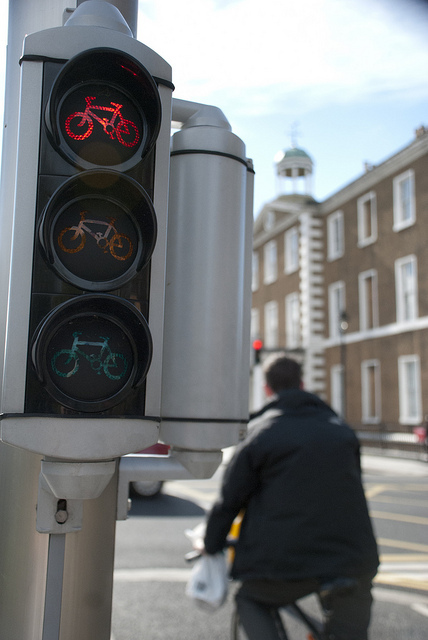 Red light jumping and cycling on footpaths are expected to some of the first targeted offences. There are mixed feeling among people who cycle about the planned fines — with many people who cycle saying on social media that they support the idea of fines. As we reported in October, the Government’s Road Safety Strategy promised that the fines would be in place by “Q2 2014” — so their introduction is already 6 months late and counting. At the moment, when a person on a bicycle is caught breaking a red traffic light or cycling on a footpath the only options available to gardai is are a warning or to bring the person to court. The plan would bring cycling in line with motoring and allow for out-of-court fines which are less time consuming for the gardai, the courts system and the offender. Those who do not pay the fine and context the charge in court will likely be fined a higher amount. “This seems to be a ham-fisted approach at trying to solve the problem of dangerous cycling. As anyone who has cycled in a major urban centre knows, it’s a nightmare to negotiate vehicles and careless pedestrians; a problem compounded by the dangerous road infrastructure,” said Cuffe. He added: “Many cyclists are rightly furious that the new €50 fines are larger than the penalties for parking on a cycle lane. This dangerous practice forces cyclists out into traffic and puts lives at risk. Tackling one dangerous behaviour while allowing another, more serious breach, to get less attention serves to show where the Government’s priorities lie. He said that towns and cities across the country are still awaiting contraflow lanes that would “solve the problem of cyclists venturing the wrong way up streets”, and that cyclist-friendly traffic light systems are still absent “despite their successful introduction in many European cities”. “Ireland is not a bike-friendly country, and until the Government acknowledges the many hazards and difficulties that cyclists face on a daily basis, these fines will do little to allay the problems we see. Minister Donohoe would be better off progressing plans to operate automated red light running detection equipment at traffic signals to penalise drivers who break the law,” said Cuffe. As we reported last year, 3,200 Irish cyclists were summoned to court in the last ten years. The lack of a system of “on-the-spot fines”, officially known as fix charge notices for cycling offences means that gardai must bring bicycle users to court. The same gardai must be present when the case comes before the courts. The accused will often have to take a day off work to attend court. So the fines also should be around 40-200 times lower.